One survey says the Netflix price increases are very risky, another not so much. Which is right, and how many people will really head for the door? Some decided this was the biggest price increase in Netflix’ history. It is not. Netflix first introduced streaming as a free benefit to subscribers of its disc-by-mail service. It later split out the streaming service and started charging $5.99-a-month for it. A $6 price increase certainly beats the most recent $2 increase. However, the price increases have led to much speculation about whether subscribers will pay the increase. Here are two contrasting views. 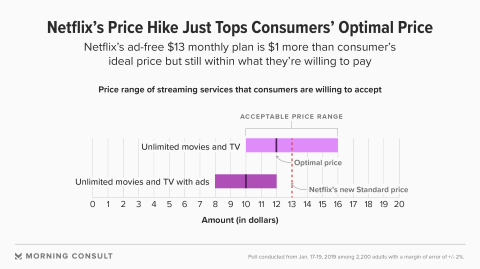 The Morning Consult and The Hollywood reporter fielded a survey to 2,200 adults last week to examine how likely people are to pay the higher prices for Netflix service. The poll asked consumers to say what they would pay for an ad-free and with-ads “unlimited movies and TV service.” Using analysis techniques, The Morning Consult concluded that the optimal price with-ads is $10 and ad-free is $12 a month. Given most people are paying for the middle-tier Netflix plan, it sounds like the company could be at risk of losing many subscribers. It is interesting to note that The Morning Consult data suggest Hulu didn’t need to cut the price of its entry-level subscription plan with ads from $8 to $6. It could even have increased the price a dollar or two! Hub Research fielded a survey to 415 Netflix subscribers just after the announcement of the price increase. What they found was that 75% said they would either keep their current subscription or upgrade. 16% said they would downgrade and only 9% said they would cancel entirely. Surprisingly, half of Netflix subscribers are unfazed by the price hike. 15% even took it as a positive sign that the service would get better with more content. More understandably, the other half of Netflix subscribers told Hub they are unhappy that prices have gone up again. However, only 8% are angry about it. 70% of U.S. adults have an SVOD service, and 70% of those have Netflix. The next most popular service, Amazon Prime Video, is only in 30% of SVOD homes. Also, most Amazon Prime Video users don’t pay for it directly. It comes to them as part of their free shipping subscription to Amazon Prime. 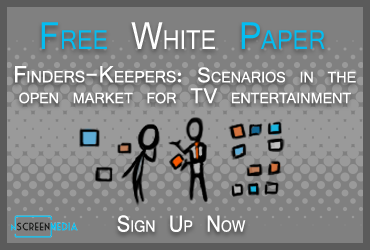 In other words, the pricing benchmark for SVOD services in most homes is Netflix. When asking consumers in a survey about a hypothetical SVOD service, it is only natural for the consumers to use Netflix as their reference. In other words, it’s no accident the optimal price for an SVOD service came out to be $12. That’s probably what the average Netflix subscriber pays. How many people will leave Netflix? So, how many people will follow through with their intention to quit over the price increase? Probably not many. In TiVo’s Q4 2017 Video Trends Report, 13% said that planned to get rid of their pay TV service in the following six months. Cable, satellite, and telco TV providers lost just under 2% of their subscribers in the first two quarters of 2018. If the same happens to Netflix, the Hub data suggests the company could see 600,000-800,000 people leave. However, the company will continue to deliver strong subscriber growth, even if it loses 0.8 million subscribers to the price increase. Netflix gained 2 million U.S. subscribers in Q1 2018 and 8 million subscribers overall. It is forecasting to gain 8.9 million in Q1 2019. Some survey data says many will quit over the Netflix price. Other data says the opposite. People may say in a survey that they intend to quit a service for some reason. However, few follow through with the action. When averaged across the current three price-points.